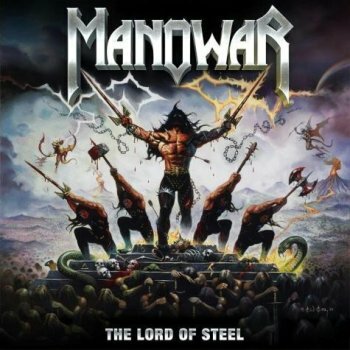 MANOWAR - THE LORD OF STEEL [RETAIL EDIT.] (CD IMPORT) | Online Shop | Wizard LTD. Album: "THE LORD OF STEEL [RETAIL EDIT.] (CD IMPORT)"
The Lord Of Steel, MANOWAR&apos;s 12th studio album, is blazing with pure power, untamed energy, and a sound as raw and wild as a force of nature. Track titles like Annihilation and Hail, Kill And Die! set the tone for a record that is packed with surprises. In contrast to the 2007 release Gods Of War, this new album is not a concept album, yet each song tells a different story, retaining the MANOWAR vision of righteousness, honor and everything MANOWAR fans have come to know and love. MANOWAR fans should expect to have "their heads completely blown off" said MANOWAR bassist Joey DeMaio in a recent interview, and explained that "…this album is all about brutality and raw power!" "We were talking about a concept album but then got inspired to go in a different direction. This is where we are right now." explained Joey DeMaio. "We have completely revamped our studio once again in order to give our fans the very best sounding tracks. This album will definitely blow your speakers!" Known for their adventurous spirit and for never releasing the same style of album twice in a row, MANOWAR have this time tapped into the world of action heroes and their stories, writing their first song specifically for a Hollywood movie, &apos;EL GRINGO&apos; and another one, Expendable, inspired by Sylvester Stallone&apos;s action movie franchise &apos;The Expendables&apos;. El Gringo is the theme song of the action western &apos;EL GRINGO&apos; featuring Scott Adkins (&apos;Expendables 2&apos;, &apos;The Bourne Ultimatum&apos;) and Christian Slater and produced by After Dark Films (&apos;An American Haunting&apos;) and Joel Silver&apos;s (&apos;Matrix&apos;, &apos;Lethal Weapon&apos;) Dark Castle Home Entertainment.